Summer Streets in full bloom. 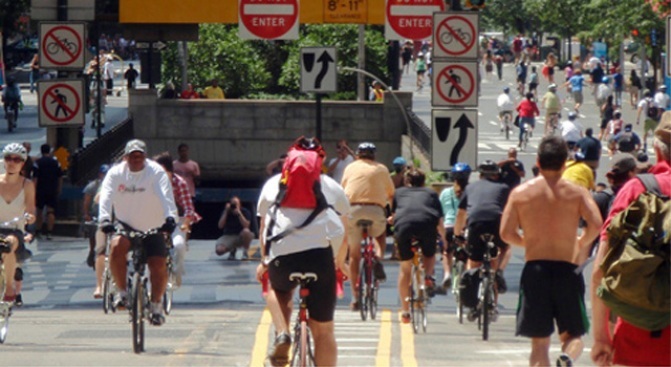 Mark your calendar for August 8, 15 and 22: On those Saturdays, for the second year in a row, Manhattan will feel like Rome or Paris as nearly seven miles of ordinarily auto-choked asphalt get closed to cars, drawing pedestrians out to stroll in the (pray for it) sunshine. The 2009 Summer Streets program route starts at the Brooklyn Bridge and ends at 72nd Street, winding along Centre and Lafayette Streets and 4th and Park Avenues along the way. NYC’s website has a full map, complete with clickable suggestions of fun route-side stops. For walkers, bicyclists, skaters, and other non-motorized types, expect it to be one big, awesome block party. For anyone trying to get around by car that day, expect the traffic overflow to make driving particularly hellish. Enjoy!